Our tableware is always made of carefully selected good grade material and crafted with very advanced treatment process to ensure quality and safety. They are outstanding on scratch resistance and extremely difficult to bend. Pure white ceramic joint together with shiny silver stainless steel. Makes it suitable for all the décor style and all formal or casual occasion. - Made of high-quality food grade stainless steel, it is safe, durable and beautiful. - Process with mirror finish treatment, finely polish on each sharp edge, makes it safe and shiny. - The combination of ceramic and stainless steel is a great fusion of the classical aesthetic and the modern beauty. - Ergonomic design ceramic handle makes it very comfortable to grip. 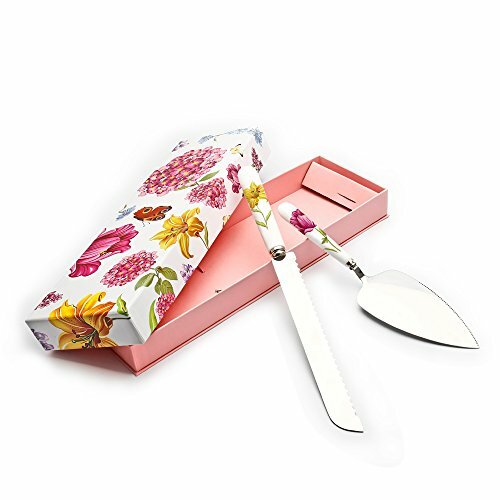 - 1 bread knife and 1 cake shovel are packed carefully into the delicate pink box, a perfect choice for the gift. Please don't use the dishwasher machine to wash this tableware set due to ceramic handle, hand wash this tableware set and storage them in cool and dry environment. Thank you for choosing Elegant Life, please contact us by email if you have any questions, we will be happy to assist you at any moment. If you have any questions about this product by ElegantLife, contact us by completing and submitting the form below. If you are looking for a specif part number, please include it with your message.